Under the direction of Kyle Govert, the Lowell Middle School Band program is seeing a resurgence of numbers in the band program this year. The sixth grade band is now split up into three classes, with one of the classes entirely made up of clarinet players, otherwise known as Mr. Killion's dream class! Student Leaders Chosen for "Magnum Opus"
Last year, several students in the Lowell Band and Guard Department were approached with the idea of creating a membership of student volunteers that would work together to participate in community outreach, service, and school functions. This group was to also develop a name for the group that would help identify it's purpose... hence we have "Magnum Opus." In Latin, the phrase Magnum Opus refers to an artists "greatest work." Our students decided on this moniker due to the nature of the work that would be done in Opus. Thus far our students have started to assemble canned goods that we will take to food pantries this fall. Opus has also collaborated with Ann Myers at LHS to work this past summer in the classrooms to help our custodial staff with the large task of emptying, cleaning, and then reassembling the classrooms around the school. We are currently in the early planning stages of teaming up with our Special Education Department in a fundraiser that will benefit several students with special needs around NWI. As time rolls on we hope to have even more opportunities open up for our newly formed group of volunteers. So, who can be in Magnum Opus? Any and all high school students that are actively participating in a band class, band extra-curricular, or guard extra-curricular. At their last meeting the students set up a group of three team leaders that will be responsible for communicating with department faculty, creating agendas for meetings, and running meetings with the rest of the group. Magnum Opus President is Kimee Mooney, and Co-Vice Presidents are Hailey Goodwin and Jared Grzych. This upcoming year I would like to feature more information about our band family from other perspectives other than just the "band director's." Our students, band boosters, and staff are the heart and soul of our band and guard program and I feel it will help everyone learn about our mission and daily activities if you hear more from them. Our first look is an article written by Drum Major Megan Workman about her experiences from marching band, drum major camps, and the important lessons learned in this activity. We celebrated the end of the June marching camp and the kickoff of this year's marching season with our annual Parent Day and BBQ Dinner. It was a blast! Our students "taught" the parents the ropes of how to march, horn carriage, even flag and sabre tossing. We concluded with a BBQ dinner courtesy of the TCBB and the potluck items our families brought in. Visit our Photo/Video page to see more from the day! The contests for this year have been posted on the CALENDAR. Please take note of the Saturdays that we will be out and make sure you have those days available. We will need all of our student performers, of course, but we will also need parents galore to help spur the LMRD along as they perform across the state! The exact schedules are not posted yet, but they will be updated as soon as I receive the schedules from the contest directors. 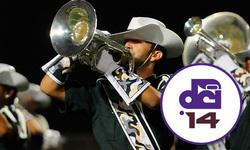 Drum Corps International is coming to our area!! Tuesday night, June 24 at Merrillville High School at 7:00pm. Tickets range from $15 to $25. Phantom Regiment and Madison Scouts will be performing as well as Troopers, Pioneer, Colts, and Crusaders. This is a great way for parents and students new to competitive marching band to get some first hand experience. If you are not new, this is a great show with awesome performances! Click the link for more information. Welcome to LowellBands.org and a new, streamlined look for this school year. You will notice that our site has become more clean and minimalist in hopes that visitors will have an easier time navigating the site as they learn about our program. We are hoping to add a MERCHANDISE page soon so family and friends can purchase items to show off their support for the Lowell Band and Guard! Check back often for updates and news.